Pinnacle bought a new white Dodge Ram truck during the spring of 2017 and decided to place a challenge on their designers in order to have little friendly competition via social media. 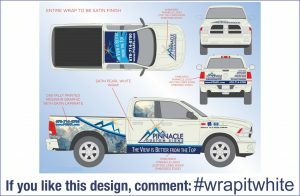 Each of the three designers was given the challenge of creating a unique vehicle wrap design using the basic tenants of Pinnacle’s branding. Each of the designers used a different base color to begin their work in creating a design that would hopefully capture the most votes through Pinnacle’s social channels on Facebook, Instagram, and Twitter. Pinnacle designers Derek, Josh, and Joanne all had the same truck canvas and basic company website, phone number, and tagline to use in their design. It was the different use of those elements that capture the unique ability to do so much with a vehicle wrap. He then used stripes and circles to add an elemental perspective and color to an otherwise solid texture. 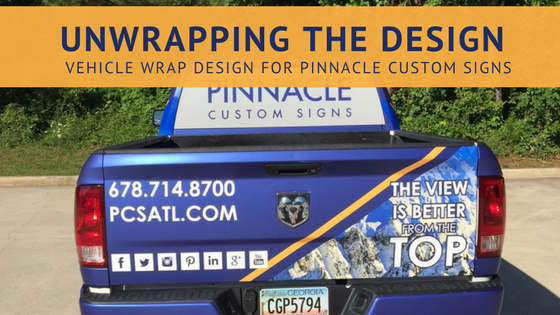 The remaining colors he used in his design are all within the Pinnacle Custom Signs logo for uniformity. The phone number, website and business description areas are graphically embossed to show depth with a dimensional effect. Another element that Josh integrated into his design was logo embossing on the vehicle. The plan was to place a slightly larger Pinnacle logo in calendared vinyl underneath the wrap film. This will give the effect that the logo is raised or embossed on the vehicle. 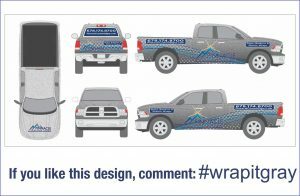 Josh’s design included satin laminated printed mountains on the bedsides, giving the entire truck a satin finish. Josh then used the space on the tailgate to brand the lengthiest information because the rear end of a vehicle gets far more look time than any other part of the body. Unlike with the other designs, he used this space to add a list of services to capture the attention of the person following the truck. He then used the simple philosophy for the side panels and created designs with easy to remember information. “Most people will be passing your vehicle as they read the sides and may only have a few seconds to remember a phone number or a website- Sometimes less is more”, said Josh. Josh also pointed out that he avoided dark colors on the wrap design because a dark colored wrap on a light vehicle runs the risk of exposing the vehicle color underneath if an inaccurate cut is made. Since it isn’t possible to wrap into every nook & cranny, the original vehicle color will still be exposed in certain places such as underneath the tailgate or between the bed and cab. Joanne choose to use several layers of vinyl, the first of which was an Avery Supreme Wrapping Film in Matte Metallic Brilliant Blue. Then a Matte White Film was selected for the text and front quarter panels. The digital images in her design use a gloss laminate which really makes them pop off the matte vinyl. The combination of the mountains and metallic blue background portray Pinnacle’s brand and imagery beautifully. Vehicle wraps are becoming more popular to attract customers to businesses. The addition of color and design elements to vehicles is an aggressive ad campaign that is constantly catching the attention of potential customers. 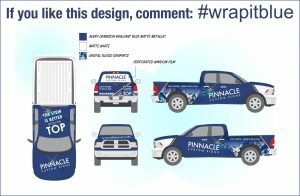 Through using our own vehicle wrap project to create three options for our basic white truck, we hope to create inspiration for your own team to think outside the box at all the options available to brand your company vehicles.